At the Modern Ballroom Dance Studio, we’re no strangers to exercise and staying in shape. While dancing can be slow and low-key at times (slow-key, if you will), other styles of dance like the Cha Cha and Salsa dancing are full of energy and muscle movement. As such, it’s incredibly important that our team of dance instructors are on top of their fitness game. We consider ballroom dancing to be a fun, elegant, engaging, and surprisingly tough form of exercise that helps keep us in shape. It’s cyclical; we work out to dance and we dance to work out. From the simplicity of the Country Two-Step to the carefree nature of the East Coast Swing, we’re always moving and shaking. Our goal? To pass on our passion for dancing onto you! If you’re even remotely interested in learning how to ballroom dance, our Top Rated Local® Dance Studio in Northern Virginia is your one-stop-shop solution for all things dance. We welcome beginners with open arms and encourage those who are a little bit shy to loosen up and get moving with us! Time and time again, dance class attendees are blown away at how much fun they’ve had, and again, the quality of exercise that they received. We wouldn’t have it any other way. Learn more about our dance classes in Virginia by getting in touch with Modern Ballroom Dance Studio! 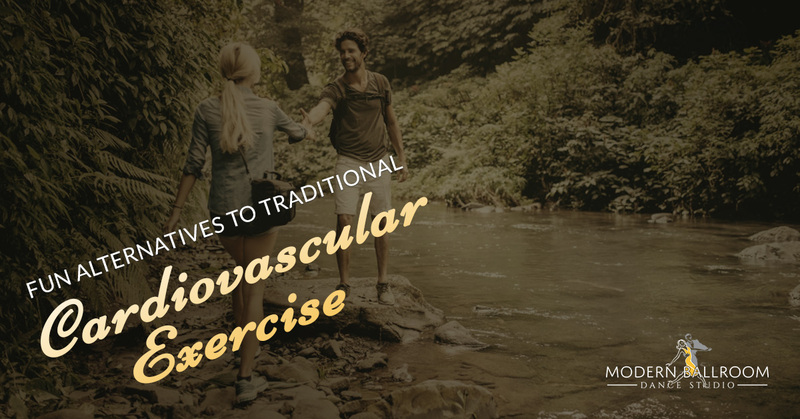 In line with our ever-constant need to stay active, here are some of our favorite nontraditional forms of cardiovascular exercise. We love all of the countless hours that we spend at our ballroom dance studio in Woodbridge, but at the end of the day, it’s nice to get outside and breathe some fresh air. Of course, we’re not opposed to dancing outdoors on a nice hiking trail, though we’d anticipate receiving our fair share of weird looks from hikers. It’s true that walking isn’t a very “intense” form of cardiovascular exercise, but it is a great, low-impact activity that does elevate the heart rate a little bit. Better yet, it’s a great way to think through things when there’s a lot on your mind. Again, we tend to dance out our emotions, but there’s nothing wrong with taking a long walk outside to clear our minds. It’s not unheard of for some elementary schools across the United States to do what’s called a “jumpathon.” Essentially, it’s a school-wide event that helps raise money for charity by jumping rope for as long as possible (barring flat-out exhaustion, of course). From an exercise standpoint, jumping rope is a fun way to utilize your hand eye coordination and elevate your heart rate for an extended period of time. Plus, we’re always coordinating and landing on our feet when we dance, so jumping rope is just a great all-around activity for us dancers. Swimming is a fairly popular form of cardiovascular exercise, though not nearly as popular as running because people don’t always have access to a pool while throwing on a pair of shoes is easy and convenient. Even a few leisurely laps in a pool is more than enough to get us breathing hard, and better yet, swimming also serves as a whole-body exercise that works out just about every muscle associated with the arms, legs, and even core. We’re all about taking the leisurely approach to swimming pools, but they truly serve as a great workout that helps build our dancing muscles! Whether you’re playing hockey, basketball, soccer, or another aerobic sport, this is a great way to get in shape without even realizing that you’re getting in shape during the experience. When you’re having fun and exercising in a competitive mindset, it’s easy to forget all of the pain that would otherwise be associated with something like running. Get In On the Fun and Join Modern Ballroom Dance Studio Today! The best time to give dancing a shot is always right now. Why wait and let your dreams be dreams? Check out our new student special and sign up for your first ballroom dance class in Woodbridge.